Did matteo send that one as well or did you find that one? Where is it from, and where can I get one? Nice socket. Bulky though. I've been putting off the slow steel filing I need to do to make it fit! But the effort should be worthwhile. All the modifiers fit perfectly! I have made the middle layers that got a bit skewed align correctly with bottom and top layer, so now I just need to file stab holes before I can continue (and figure out if I want black or brown switches). Filing the stab holes turned out to be a bigger problem, no matter how much I file the stabilizers seems to get stuck or not fit that great (when tested with keycaps on) and some of the holes has got quite a bit filed away already :/ but I am sure i'll make it work! You're not alone, Broadmonkey. Stabs are a bit mysterious for me, too. Perhaps I should have waited on getting some before I soldered up my matrix. Filing between switches might get hair raising! You went for Cherry stab compatability, right? Maybe the Costar only guys like me have it easier. Or looking again, maybe not. Eep! oh, that is a bummer! it makes quite a mess (for what it is) and you even have to file stainless steel! I don't think it'll be a big problem that you have to file between the switches, avoiding wires might be the biggest problem, though. Looks great. It should be fairly easy to embed it between layers where the middle ones has a cutout for it. My mouse might need one as well. Why a socket on the mouse? Well to that my dear sir I ask you; why not? Even the daisychaining ADB that Apple used from the eighties until USB, which let you choose which of the keyboard's two identical ports to hook your mouse to, wasn't as audacious as to give the rodent a detachable tail! I like it. That alone would have saved most of my mice over the years, in fact. I need to shoot an explanatory picture to show the filing I need to do for the shiny socket. It's quite a bit if I want a good snug fit. Besides, I'm taking notes for next time. All I need to make another keyboard (besides stabs which I've none) is the metal! matt3o wrote: post your matrix and your teensy pinout and I'll help you with the firmware if needed. I'm learning a bit of Teensy programming while investigating this, because I'd like to write a simple tutorial on modifying just the right part of the GH60 code to support any layout. Partly for myself, actually, as I've future projects in mind! What is the full list of key codes, like "LBRC,RBRC,BSLS" etc. that are available to send out? I'd like to try media keys in my layers. The names are not the same as Soarer's converter, which has its own list that I've used extensively. And how does matrix.c know about empty positions in the matrix without explicitly telling it? Obviously the last row has fewer keys, thanks to the space bar. Why aren't there more commas in that line to make it explicit which column the remaining keys are actually hooked up to? Looking at your hardware matrix, you did the same thing as me: make tidy columns instead of "left justifying" the matrix like the code suggests with its missing commas. Muirium wrote: What is the full list of key codes, like "LBRC,RBRC,BSLS" etc. that are available to send out? I'd like to try media keys in my layers. The names are not the same as Soarer's converter, which has its own list that I've used extensively. Muirium wrote: And how does matrix.c know about empty positions in the matrix without explicitly telling it? https://github.com/tmk/tmk_keyboard/blo ... 0/keymap.c , line 33-45. Note the KC_NO. Oh, Broadmonkey: filing around my circuitry shouldn't be too horrible. I managed to keep the slots mostly clear, and can resolder or reroute what overlap does exist. Still steel though. Gotta wait for my stabs to know for sure. Finally I am done wiring the matrix and connecting it to the Teensy. This took such a huge effort that I think it is probably worth the time and money to design a PCB and have it produced. More pictures are in the photo album starting here. Next I want to verify all the connections, then connect the various extra components. Also I have to pick up some resistors for the LEDs after I do the math. Nice job. You had more to do than the rest of us, so I understand your relief to have finally made it, Mtl. Perhaps Matt's "handmade PCBs" are down your street. If I do another of these boards (and I think I will), it'll be a TKL or thereabouts and probably a good candidate for that too. The Teensy++ is a pain to fit under the space bar, I bet. Its Mini-USB port looks damn close next to that switch. I made my own mini cable recently for my multi-socket Soarer's converter box, it uses a bare bones jack that might fit there. A regular cable's going to be tight. Broadmonkey: I believe I initially tested your board with the wrong base. I'm glad it is 100% working for you, sorry to hear about the stabs. Are you sure you are using them on the right side? If you made the hole so big that the stab slips away there's no way that the key gets stuck anyway. Muirium: as zifle said there are many files that need to be reviewed, I suggest you make a diff with the original repository to see what actually changed. MTL: really great project, looking forward to seeing it completed. You're excused paying our little projects daily attention. You're in the capital of the world. It's a hell of a place! Muirium wrote: Nice job. You had more to do than the rest of us, so I understand your relief to have finally made it, Mtl. Perhaps Matt's "handmade PCBs" are down your street. If I do another of these boards (and I think I will), it'll be a TKL or thereabouts and probably a good candidate for that too. Thanks. It is a huge relief. I also am looking forward to Matt's PCB. Another nice thing about having a PCB is it would help keep the switches in place. I've found that stickers can interfere with the switches latching onto the plate (especially if you remove the switch once and try putting it back in). The Teensy++ is a tight fit, though I am more worried about the wires sticking up out of it fitting vertically within the case -- another problem having a PCB would work wonders for. I'll be using one of these (without the shell) to plug into the Teensy. The wire and plug will have to rest on top of the space bar switch. I think it will fit, but haven't really checked yet. If all else fails, I will have to wire directly to the Teensy, which may require removing the USB connector. matt3o wrote: hello everyone. sorry for the late reply, I just arrived in NYC and still fighting with jetlag. Welcome to the states! If there's anything I can help you with while you're here just drop me a line. I'm close to NYC. mtl wrote: I'll be using one of these (without the shell) to plug into the Teensy. The wire and plug will have to rest on top of the space bar switch. I think it will fit, but haven't really checked yet. If all else fails, I will have to wire directly to the Teensy, which may require removing the USB connector. Right! That's pretty similar to what I did in the tight confines of my converter's project box. The box is fine, but the freaking huge (forty or more years old) rotary switch I stuck in the middle leaves very little room for the Teensy and USB-B socket, so I had to get manual. (So manual that the first time I soldered it up I accidentally made a 2.4 GHz jammer. Every Bluetooth and 802.11g connection in the house was blocked, I kid you not.) Once I've got the square ports glued in position I must take some pictures and show it off: exactly the universal keyboard converter box I've been looking for, complete with vintage knob! Meanwhile, the stepped case design that Matteo and I used leaves way more vertical space at the back of the keyboard. My intent is to put a battery and all the other gear required for Bluetooth in there eventually. Right now, it's just a breathing space. mtl wrote: Welcome to the states! If there's anything I can help you with while you're here just drop me a line. I'm close to NYC. if you happen to be in town drop me a line if you want. we can grab a coffee. Now, where'd I put my clamps? And is it best to file them while bolted together? Muirium wrote: Every American barista's nightmare: an Italian customer! I finally had a starbucks, very disappointing. Muirium wrote: Now, where'd I put my clamps? And is it best to file them while bolted together? 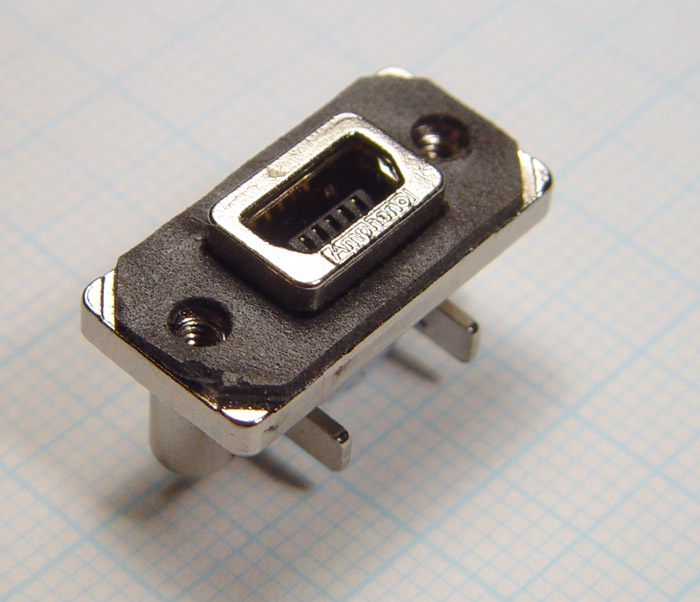 the inner part is actually easier, you don't need to file the case... but the socket itself (which is made of very soft metal). Oh, I see. I imagine that's also true vertically as the whole socket housing is easily thicker than all my slotted layers combined. In fact, I'm filing all three slotted layers you sent me together (including the one marked "don't use") as they give me a firmer filing target anyway. To use just two of them, I'd need to file the socket's outward facing part down a little too. I'm thinking of maybe filing a little into one of the other case layers instead, but the answers are all in the margins and I'll only know what I've got when I've got it. Still a lot of elbow grease ahead! Next case: I'll make the holes the exact dimensions of the socket. It's a smart wee thing. Muirium wrote: Next case: I'll make the holes the exact dimensions of the socket. It's a smart wee thing. mtl why don't you use an addressable LED strip (without the SMD LEDs)? IonutZ wrote: mtl why don't you use an addressable LED strip (without the SMD LEDs)? It didn't occur to me. Can you post a link to what you're referring to? It's been a while since I have posted any updates. Over the last couple weeks I've been working sporadically on getting the keyboard to actually work. The good news is both the keyboard and TrackPoint are now working! Though, the TP is working just barely. Here's the keyboard as it stands. It is a mess! I have tried closing the keyboard only partially and it is very hard to fit all the wires inside while not causing obstructions. It took a while to get the matrix fully debugged. There were problems with both the wiring and firmware. I should have re-read matt3o's instructions earlier because initially I had started by modifying the TMK firmware's Phantom source code, instead of the GH60. Due to the direction the diodes are facing (I think), the matrix has to be scanned the GH60 way. Just getting to the point where I could debug the matrix using hid_listen took a fair amount of effort for me. Also, I had no luck using D6 for column I/O. The Teensy wires a LED to this line, and I believe that is the source of the problem. The TrackPoint has required a lot of effort so far. The TMK firmware claims to have TrackPoint support, but I believe it is incomplete. There were wiring bugs for me to figure out, too, that caused the TP to fail its POST. Now it works (yay!) but the motion is very choppy. Not sure if it's due to a bug, all the debug code I have enabled, or just a sub-optimal polling implementation. The code I'm working with is up on github, in case it is useful to anyone. Most of the files are under keyboard/ssmx/. I am trying to keep it self-contained but have had to modify some of the common firmware files. The keyboard is still a long way from done, but when I can get enough of it working to verify there are no wiring bugs, I can close it up and start using it! that is a hell of a project, mtl. It's is hard to work on the keyboard alone and you have many more things that could go wrong. Stay focused and don't give up! Sometimes I find that it is better to leave the project for a couple of days and start over with a fresh mind. Thanks for the encouragement, matt3o. It is a huge project but it's still fun, so I will follow it through to completion. I look at it like building a ship in a bottle (lots of precision detail work), but with the benefit of having something useful in the end. Though, I have probably put more time into this than I ever will in using it! mtl wrote: I have probably put more time into this than I ever will in using it! Oh, I wouldn't say that. 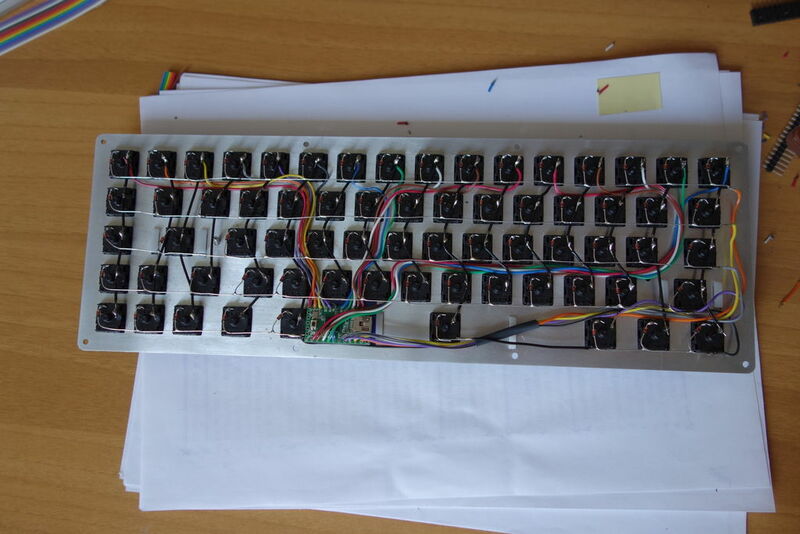 Keyboards can have a damn long lifetime if they're made of good parts. I use a couple of IBMs from the 1980s on a regular basis, while their original computers are beyond useless to me: the XT came with an original IBM PC! The time travel aspect of keyboards is part of their appeal. Technology whooshes by, while the keyboard remains the same. Don't worry about being tardy. My simpler 60% is still unfinished too. But these metal keyboards that we're making are epic stuff. Their physical presence is intense. I have no doubt that mine will take tens of years of use once it's up and running. That's my excuse for needing Round 5 caps as well as the Round 4s I already have: metal wears much slower than plastic. Gentlemen, it is complete! Typing on my Shiny assed Fox right now. Classy! It's just as tight and heavy as I always wanted. Thoroughly chuffed with this creation. Big thanks to Matteo and all of you guys in the GB for making this little beast real! You simply define the matrix, Teensy pins and all, right in the same file as the rest of the layer logic. I've been writing these for a while now, so it was all painless for me. And uploading a new config (for live editing your layers and macros) is dead simple and doesn't involve recompiling the whole firmware. Obviously, I like it a lot! A few things remain to be done, hardware wise. First is my mini USB port. I've just installed the Teensy with a USB cable straight into it for now, running out through the gap. More steel filing awaits me there! Also, I'm waiting on stabs so the three stabilised keys on my layout are wobbly if hit off centre. Oh, and the semicolon key showed up earlier but not now so there's a solder joint to go back and check. Good reason I don't code! Pictures when I've the port in place. And best of luck to the rest of you as your builds reach completion too. thanks for the update Muirium. looking forward to the pictures. Finally back home after my 1 month adventure in the US. Now to the HHFox!